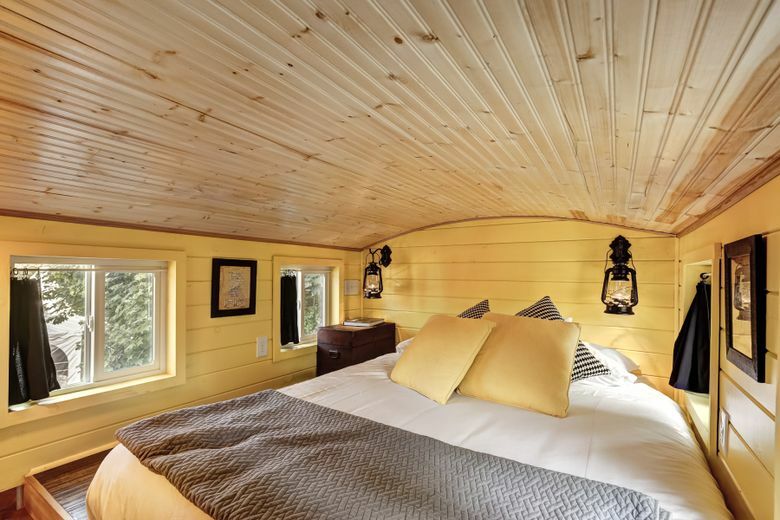 Tiny houses, a renovated seaman’s lodge and a hot-property hostel each offer something different in the way of a hotel experience — for a little less. PORTLAND — As Pacific Northwest home prices have soared, it seems hotel rates have been panting to keep up. 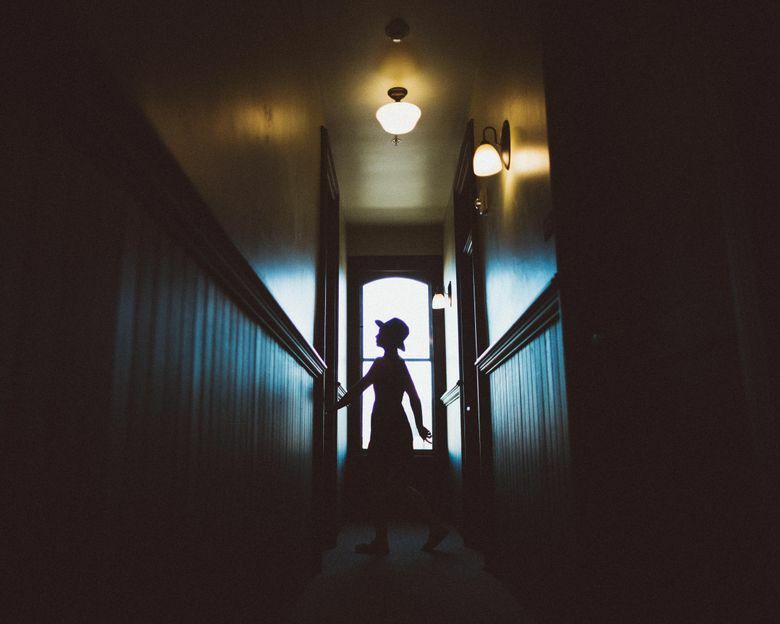 On a recent foray to this City That Likes to Call Itself Weird, a check of a favorite little neighborhood hotel found peak-season rates starting at almost $300 a night. Yikes. Sure, you can flee to the outskirts and a corporate motel that guarantees sameness from Boise to Baltimore for less than $100. Instead, I looked around and found three great little Portland lodgings that offer character — each providing a little something different in the way of a hotel experience — with two other things happily in common: (1) relative affordability and (2) owners without prior ties to the hotel industry — and few preconceptions. 2646 N.E. Glisan St., tinydigshotel.com. Online rate for a Saturday in November: $175 for any unit, two-night minimum on weekends. 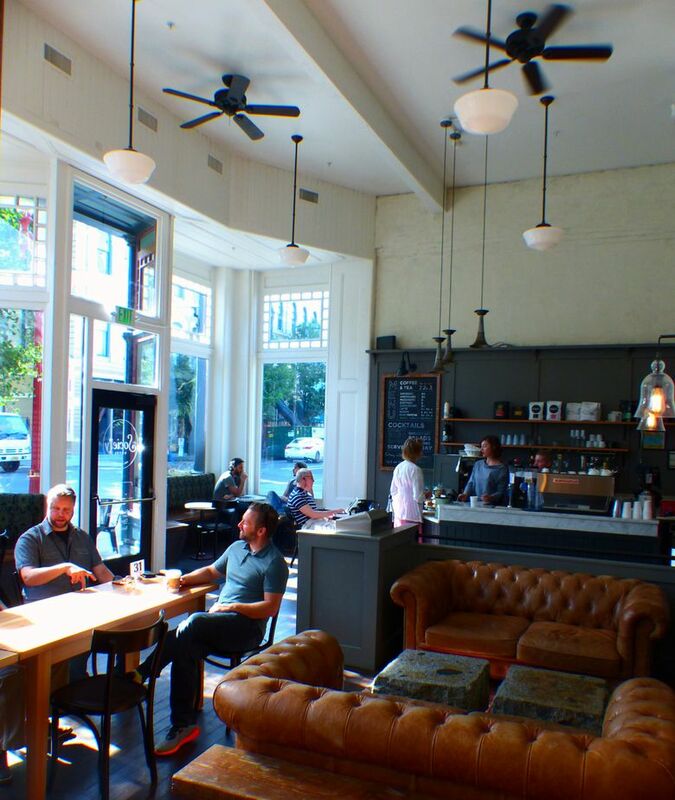 If east of the Willamette River, in the restaurant and brewery-rich Kerns neighborhood, fits your style and you’re looking to get away from the big chain hotels downtown, year-old Tiny Digs might be the place for you. 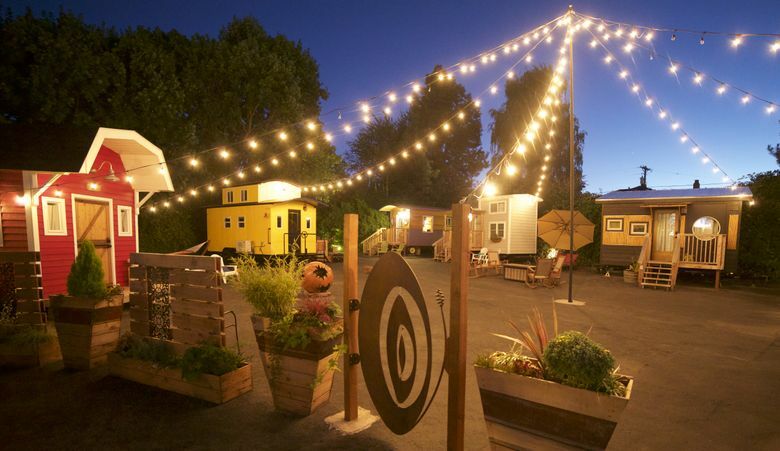 The brainstorm of two couples who first met when they were traveling by RV around the United States, Tiny Digs definitely offers a different kind of lodging experience. No cookie cutters here: Most units were designed and hand-built by the owners, including retired chiropractor Bruce Westra and his son, Kevin, who have talents in home construction and woodworking. 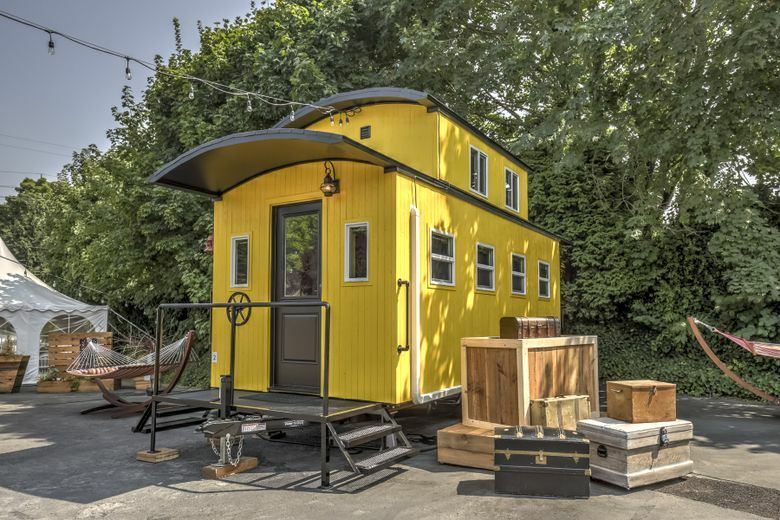 Each tiny house is about 150 square feet, has running water, electric heat and air-conditioning, a kitchen with sink, a flush toilet, hot shower, and at least a queen-size bed, usually supplemented by a foldout couch. And each has a special theme, which is what makes this a place to stay again and again. There’s the Barn, the Bamboo (with Asian-influenced design), the Beach, the Modern, the Cabin, the Gypsy Wagon and a caboose called Arthur. 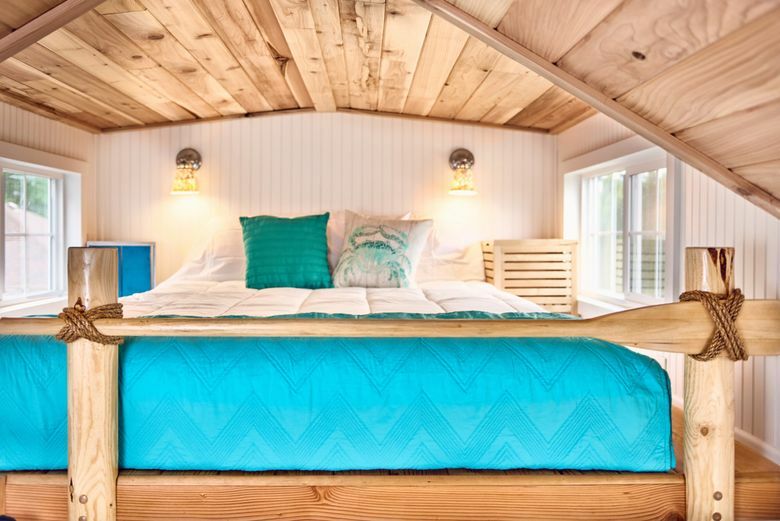 Themes are carried out meticulously inside and out; for example, the Barn has a table with tractor-seat stools, while the Beach’s bathroom sink is suspended above a bed of sand, beach glass and seashells. Krysten Norman and Kacie Garner, from Austin, Texas, were staying in the Barn when I visited. “We love it!” Garner said. “It’s cozy, it doesn’t really feel little, you can really move around,” Norman added. Now under construction and rolling on to the lot around year’s end: The Cottage, with a Victorian/“shabby chic” theme. 203 N.W. Third Ave.; thesocietyhotel.com. 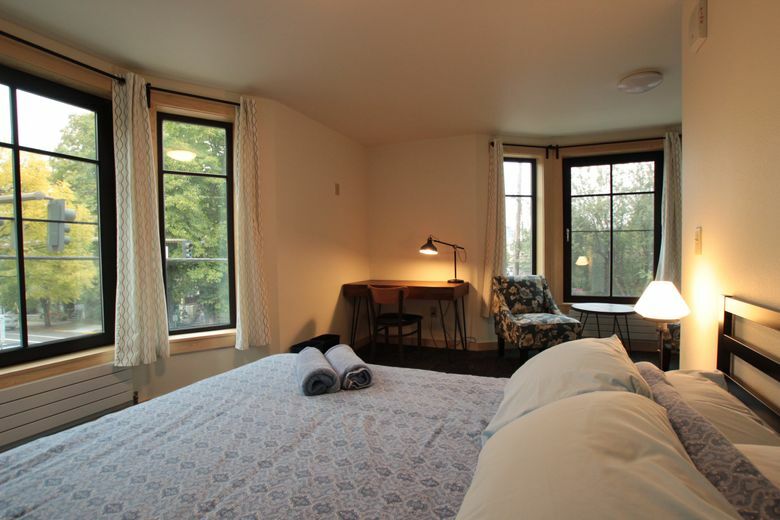 Online rate for a Saturday in November: $46 for bunk, $119 for queen room with shared bath, $150 for premium suite. 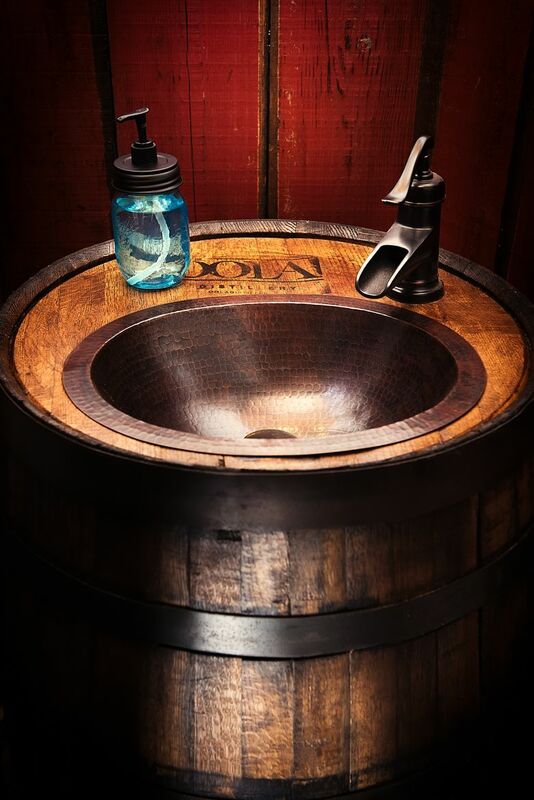 You might just call this Hotel Hip. 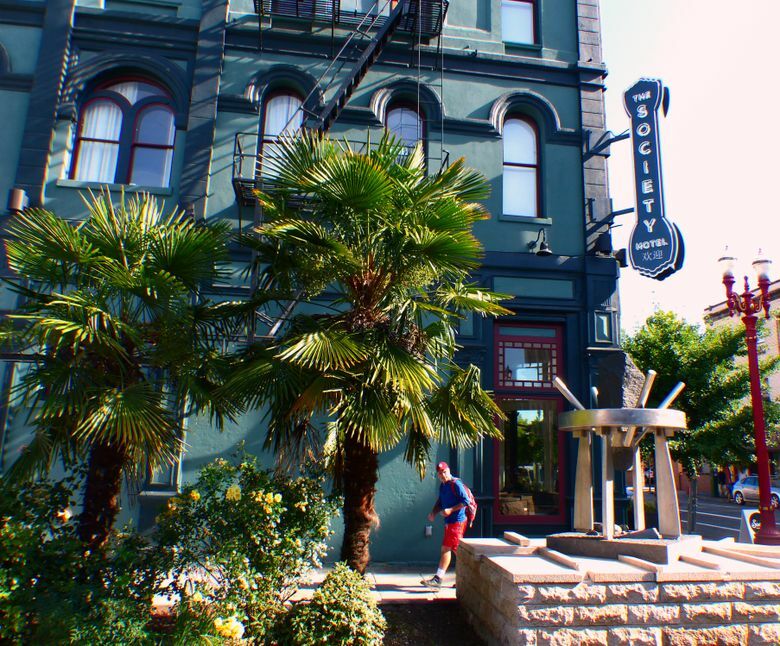 In the heart of Portland’s Old Town/Chinatown, this was originally a boardinghouse built in 1881 by the Portland Seamen’s Friend Society for sailors and shipmates who brought goods into Portland from around the world. 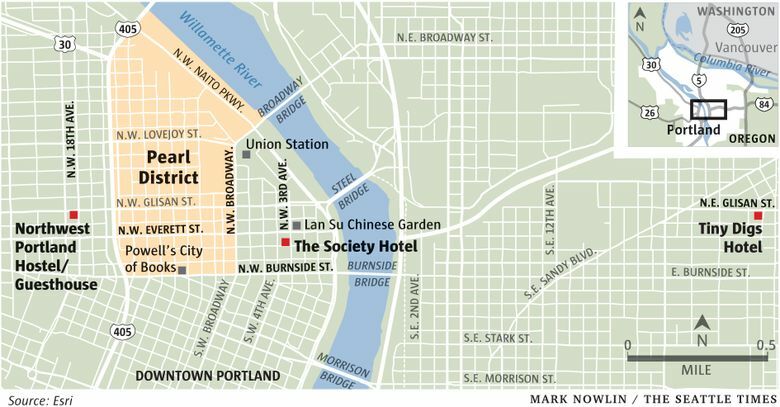 It was shuttered for decades until four business partners saw a need for more affordable lodging in Portland and embarked on a renovation that resulted in a hotel, opened two years ago, that is both on the National Register of Historic Places and has LEED silver certification from the U.S. Green Building Council. 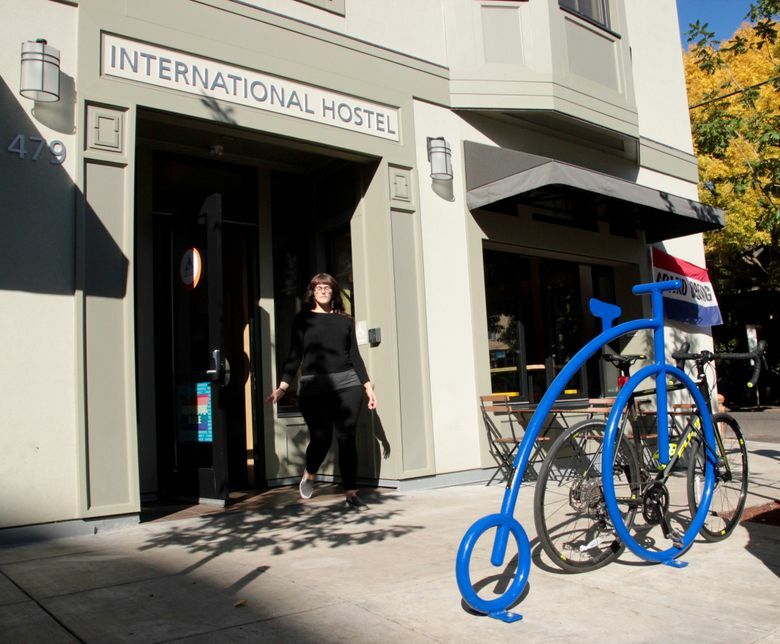 It melds the concepts of hostel and hotel. A ground-floor complex of triple-high bunks recalls, aptly enough, the sleeping quarters on an old sailing ship (but with memory-foam mattresses). Upper floors are home to 26 small, basic hotel rooms, sharing bathrooms, and 12 suites with their own bath, all with plush beds, high ceilings and 8-foot-high windows that let in lots of Portland. Decor is stark, white and minimalist. Some walls are bare, ancient brick, painted white. Look for framed, yellowed 1920s newspaper pages with blaring headlines (e.g., “Wives Facing Noose”), found when the building was renovated. The owners/partners are all travelers but not hotel people (one, Jessie Burke, traveled as a member of the U.S. Fencing Team). 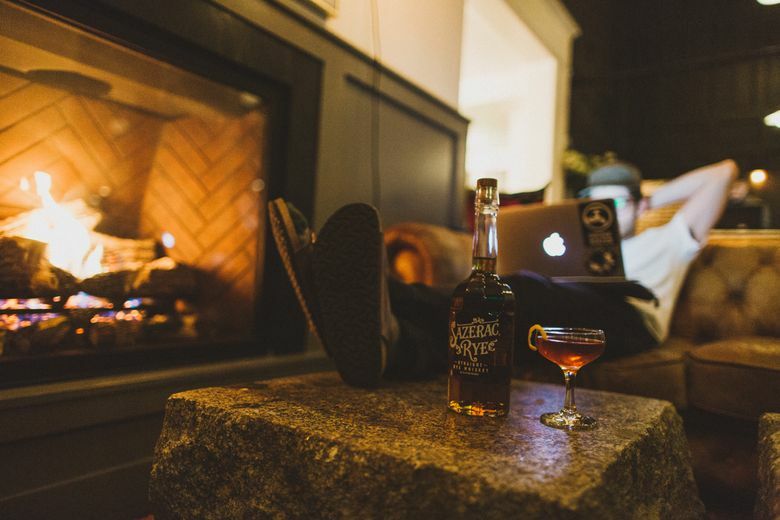 Their huge renovation resulted in creative repurposing, such as old doors that now make up the wall behind the front desk, and granite coffee tables in front of the lobby fireplace, which were originally foundations for ceiling posts. 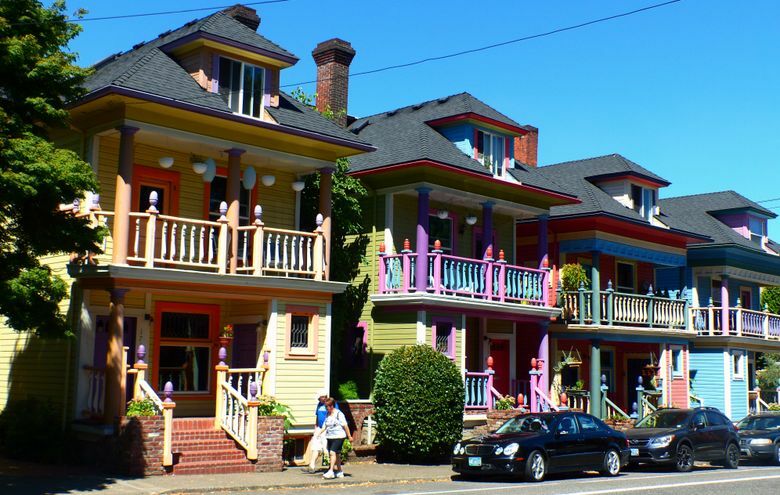 The neighborhood could be called gritty or colorful, depending on where you look — plenty of doorways are used for sleeping, and Portland’s beloved drag-queen nightclub, Darcelle’s, is right across the street. The splendid Lan Su Chinese Garden is practically next door, and the central location also puts you within a few minutes walk of Amtrak’s Union Station (take the train to Portland and you wouldn’t need a car) and the original home of hyperpopular Voodoo Doughnut (“From our rooftop, you can see how long the line is; I like to say our guests never have to wait,” quips hotel manager Jacob Halverson, who, at 26, doubtless has much to do with the hotel’s youthful vibe). 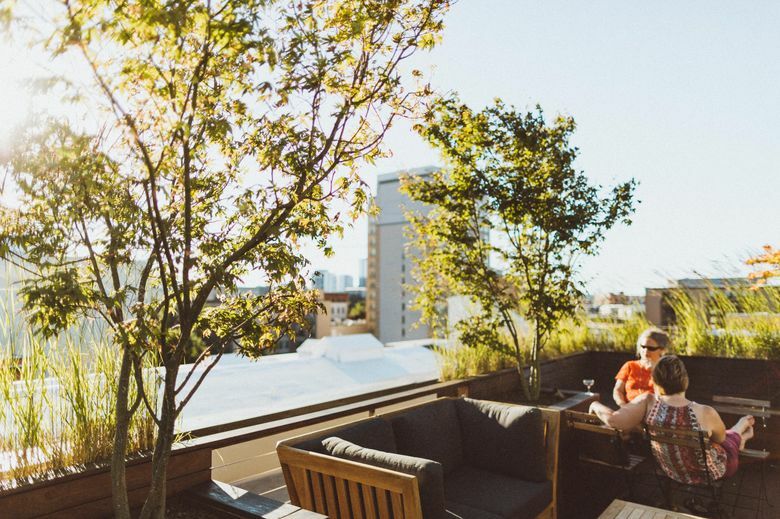 And there is a wonderful rooftop, open to all guests, with tables, cozy benches, tree-filled planters and territorial views — plus heaters for cold days. Get a cocktail or cappuccino at the lobby bar/cafe and take it up top for your own private party. 479 N.W. 18th Ave., nwportlandhostel.com. Online rate for a Saturday in November: bunks in hostel start at $31; $84 for private double room in guesthouse, $94 for private queen room in guesthouse. I hate to sound like a real-estate salesman, but this hidden gem is about three things: location, location and … you know. 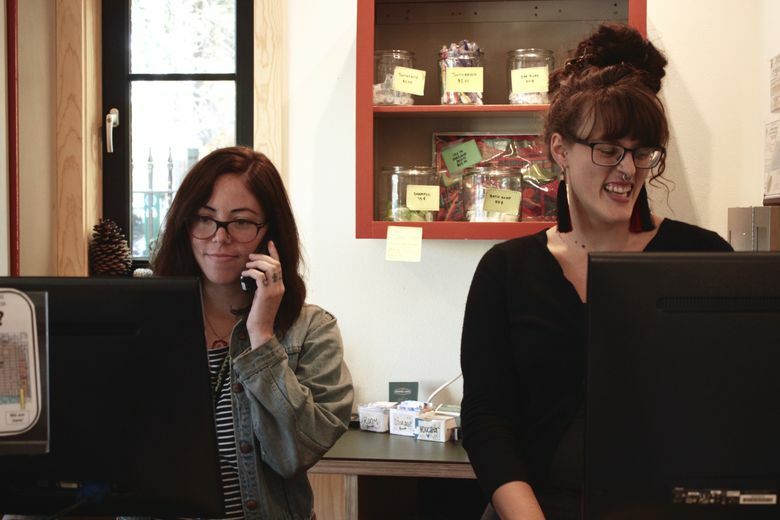 It’s just about equidistant — maybe a 10-minute walk — from downtown, the Pearl District (and Powell’s Books), and the trendy Nob Hill shops and restaurants on Northwest 21st and 23rd streets. One other bonus: You get to meet travelers from all over the world. My wife and I started staying here several years ago when a marvelous Italianate apartment building on the National Register of Historic Places was its headquarters. Though we were well past the age when we felt like bunking it in a dorm, a private room could be had for a song (or even just humming a few bars), and we enjoyed sharing the communal kitchen to fix breakfast or grab a late-night slice of leftover pizza contributed by a restaurant up the street. 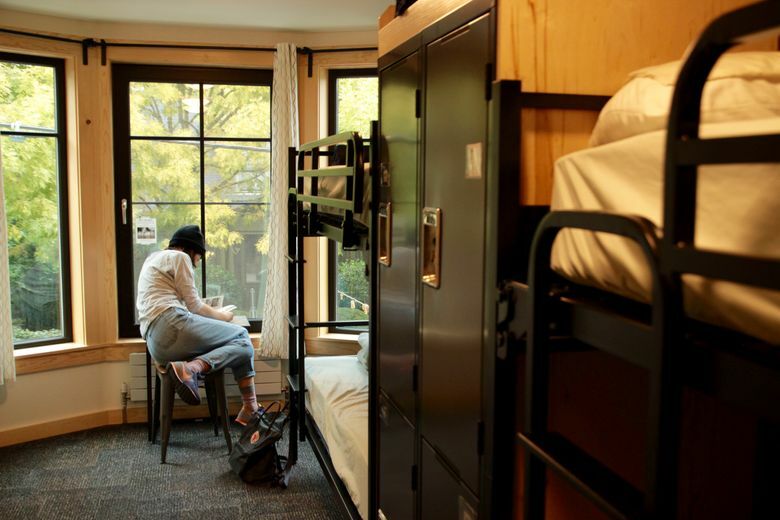 Owner Jim Kennett, a world traveler and 1970s graduate of The Evergreen State College, started the hostel in a block of old homes and apartments in the late 1990s. It progressively expanded into a village of neighboring homes and buildings (some labeled “guesthouse,” with private rooms exclusively). 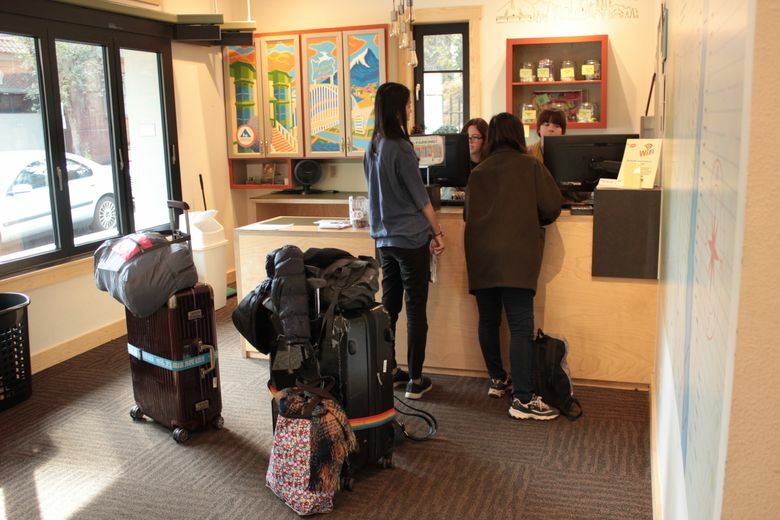 Affiliated with the worldwide Hostelling International group, his lodgings attract a clientele that is about 60 percent from outside the United States. “We see people from about 50 different countries every year,” Kennett said. Last spring came his big leap: the opening of a new, purpose-built 5-story building on what had been the hostel’s small corner parking lot at 18th and Glisan. It added 90 new beds (bunks as well as private rooms), a courtyard, a new check-in desk, a commons area and a cafe. 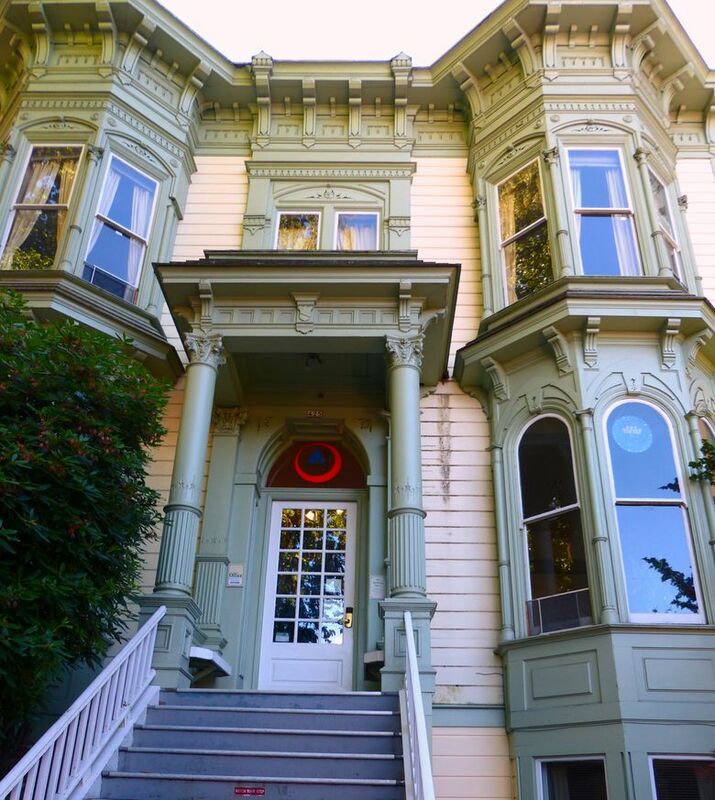 The former front office next door in the Italianate beauty was converted to a library lounge. Live music is a common offering in the courtyard or cafe, or you might just catch a visitor from Germany or Japan strumming their guitar after munching their morning bagel (included with your stay). For those who prefer to cook for themselves, the communal kitchen is still there.